This light and versatile sword features a blade made of 1065 high carbon steel. Grip exhibits wooden scales and antique copper fittings. Overall length of 48 inches. This sleek, two-handed weapon is light and versatile enough to be used on foot or on horseback. It makes for a fine slicing weapon, but has a strong thrusting point, as well. Since there was no formal name for this weapon, we have chosen “brand,” an ancient name for a sword. The strong grip has wooden scales and antique copper fittings. Made by Windlass Steelcrafts. Can be sharpened for an additional fee. I purchased my warbrand about ten years ago, back then it was sold with the corners of the handle rounded slightly, and is quite comfortable to hold. Very nice blade for the money. Very flexible blade that can "snake" it's way between plates of armor and return to true every time. The point of balance on mine is right where the grip ends and the blade begins, this makes it quite lively feeling. This sword is very much worth the price, its very well constructed and I don't think it'll ever break or come loose. Considering there's not really anywhere else to get something like this its very well done. Blade is well shaped and has a thick spine. The squared off handle is not an issue if you wear gauntlets or gloves with it. This is a pretty hefty sword. The blade is long and broad, and has a thickened ridge near the back that would undoubtedly be useful for parrying, especially since the weapon has no guard to speak of. Mine arrived with a slightly bent blade that, judging by the box, was the fault of the shipping company, so I won't remove any stars for that. It's only a 3-4 degree bend near the tip of the blade, so it's still serviceable. My only complaint about this otherwise vicious weapon is that the grip is very thick and the squared corners are uncomfortable to hold. I do have small hands, but this is the first sword to really feel uncomfortable in my grasp. If the scales used to make the sword were perhaps 1/8th of an inch thinner and rounded a bit more, I'd give this sword five stars. Got an inquiry? Connect with us, it's fast and convenient. We're ready when you are. 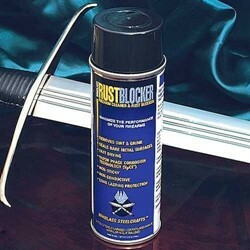 This rust blocker cleans and offers corrosion protection. Perfect for metal products, including knives, swords, axes, firearms, or any metal part. This classic style pouch made of brown leather includes eight Viking coins, finished in silver, copper and gold flashing. Measures 10" round when opened, depth of 3-1/2". This horn goblet is handmade with carved dragon scales and features deep etched lines. Approximately 11” tall with a 3” opening. Capacity of approximately 14 oz. This reproduction is made from solid 18 gauge steel and has a protective cross over the face. An attached, adjustable cloth liner and chin strap included. This large German sword exhibits a blued steel 1055 high carbon blade with a classy gun metal finish. Includes scabbard with blued steel fittings. Overall length of 42-1/4 inches.